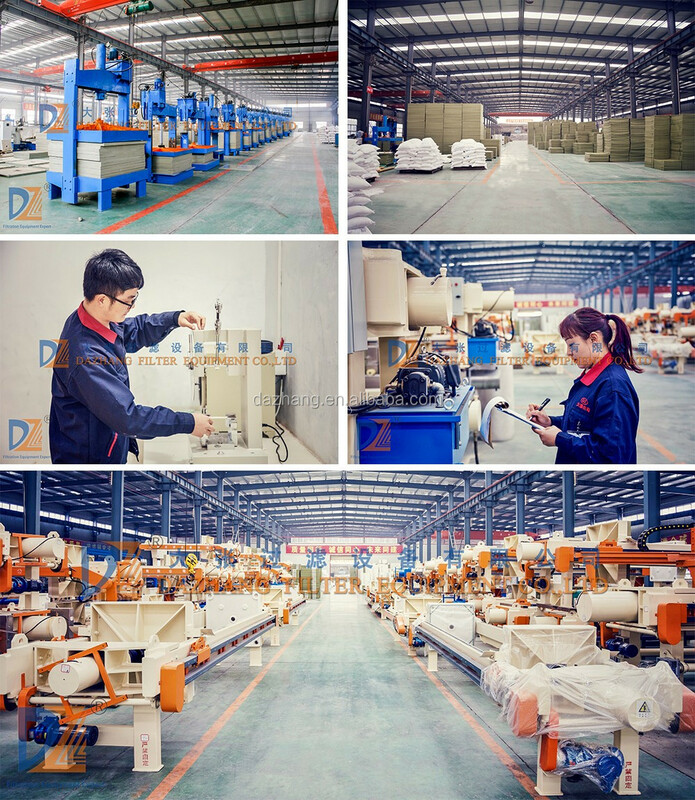 Dazhang developed various filtration plates with all kinds of speificatins and shapes. Dazhang has plates with material of cast iron, steel Q235, cast steel, stainless steel, cast copper, aluminum alloy, PP, TPE elastomer, EPDM, NBR and etc. Futures: High Temperature and high pressure ressistance, excellent sealing and cake washing, anti-corrosions, short filtration period, lower cake moisture. The hydraulic chamber filter press is widely used in many industries, its plates compression is finished by hydraulic cylinder, and pressure holding can be done manually or automatically, wide application, such as wastewater treatment, chemical industry etc. 1). Simple and easy to operate, low operation and maintenance cost, saving money. 2). Better dewatering effect, reducing the moisture content of cake within 20%-30%. 4). The main material of frame is carbon steel:Q235, beams with rectangular tube seamless welding, special frame deformation, strong and durable. 5). Filter plates is made of pure PP, do not contain other filler. not recycled material, high strength, light weight, corrosion resistance, acid and alkali, non-toxic and tasteless. 6). Various kinds of filter cloth which suit for different kinds of material, improving the filtering accuracy. 7). Special faucet with polypropylene materials, quick opening type die forming, strong and durable, high temperature resistance, strong acid and alkaline. Coating, paint, pigments, silica, caustic soda, soda ash, alkali salt mud, white carbon black, silver sulfate, copper sulfate, ferrous sulfate, potassium sulfate, potassium chlorate, phosphor, saponin, graphite powder, bleaching powder, ferric oxide, water purification machines (aluminum sulpate and polyaluminium chloride, basic aluminum lithopone). wastewater, sewage and waste, chemical electrolysis of water environment. Strain, HuangLianSu, aureomycin and McGrady enzymes enzyme, Wells, inositol guangzhoumetro, phytic acidcalcium, Chinese traditional medicine, saccharification, growth hormone, organophosphate, pig’s blood. 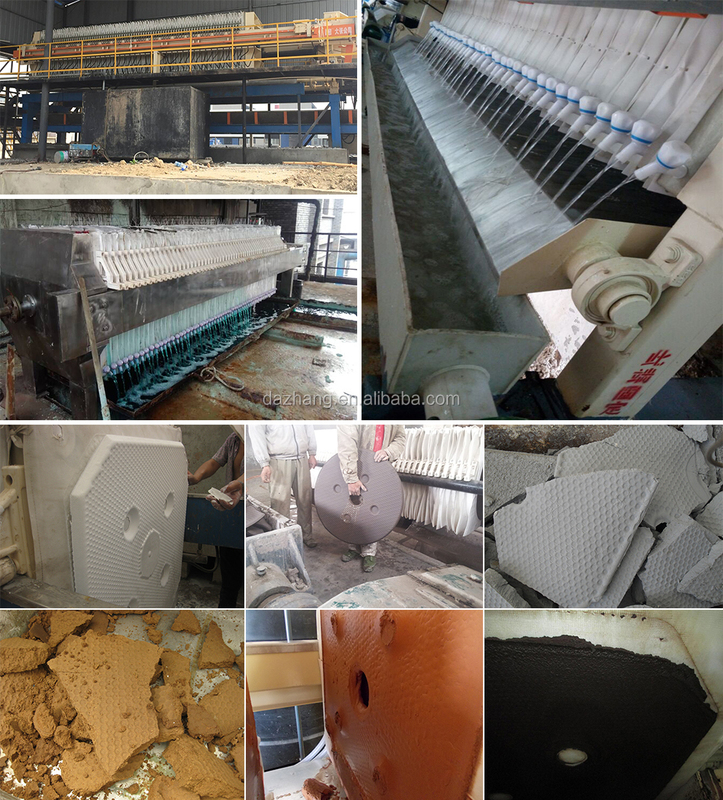 Bentonite, old soil, electronic ceramic soil, kaolin, active soil, porcelain clay, limestone, granite furnaces. Gold, silver, copper, zinc, iron, rare earth powder processing, etc. Diesel oil, sesame oil, white oil, machine oil, shortening dewaxing, vegetable oil. Our technical support team which have the professional knowledge level will help you to solve the problems that you meet in the using process of the solid-liquid equipments. In the process of the clients buying the products, we will provide clients the satisfactory and considerate service through a series of rigorous service style. We respect clients and always devote ourselves to improving the total of clients: help clients to draft solving plans. 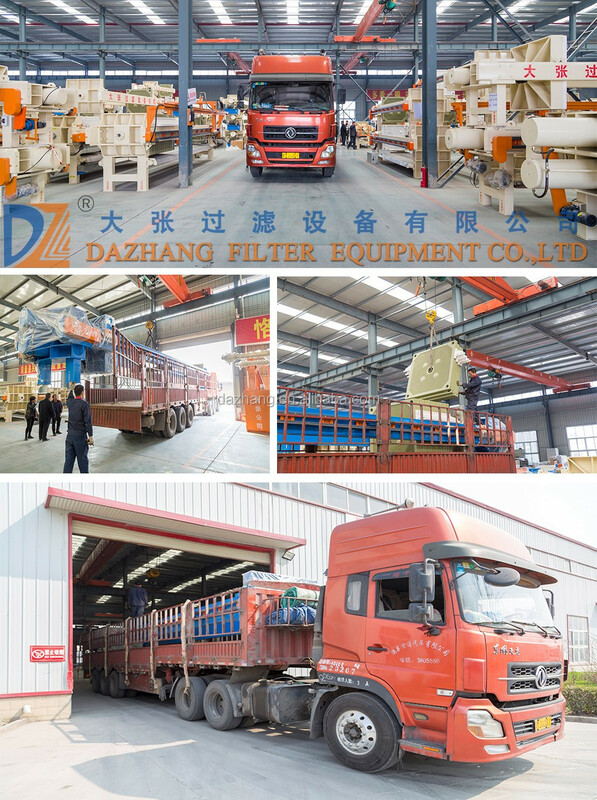 Dazhang Filter Equipment Co., Ltd insists on providing clients with overall solutions from equipment recommendation to debugging and installation, worker training, technical support and maintenance. Our mission is woking through professional consulation, exquisite thchnical support and standard solution in order to constantly meet your neds, and finally achieve satisfactory results. 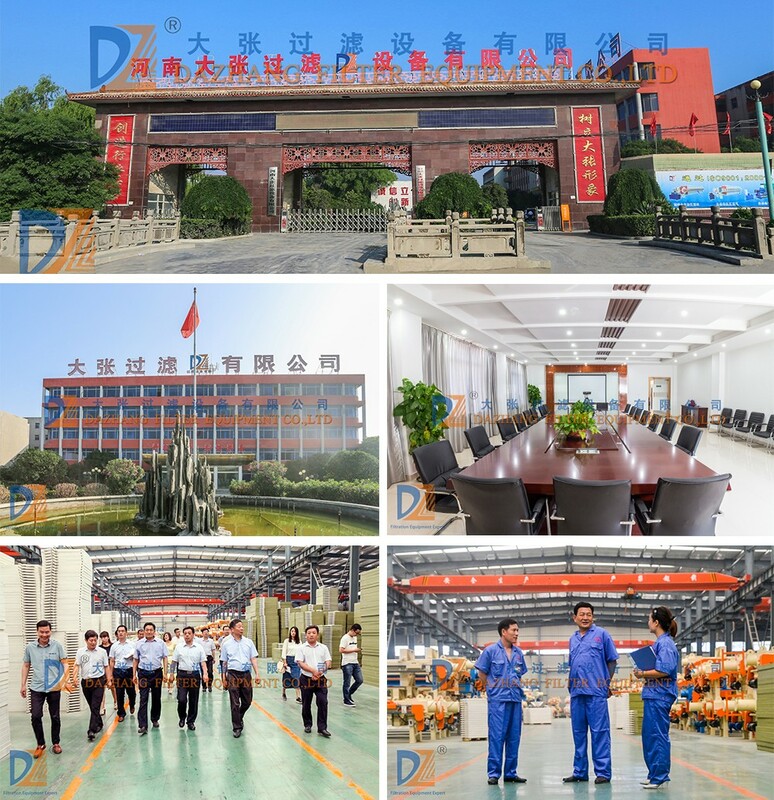 Dazhang Group has been largely adopting new technologies, new techniques and high-tech equipments. 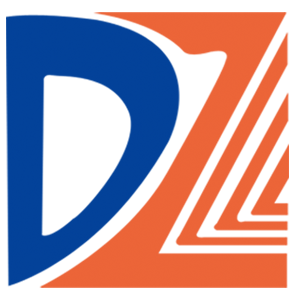 And Dazhang Group also has strict and effective quality control system. We have obtained Iso9001 quality system certificate. 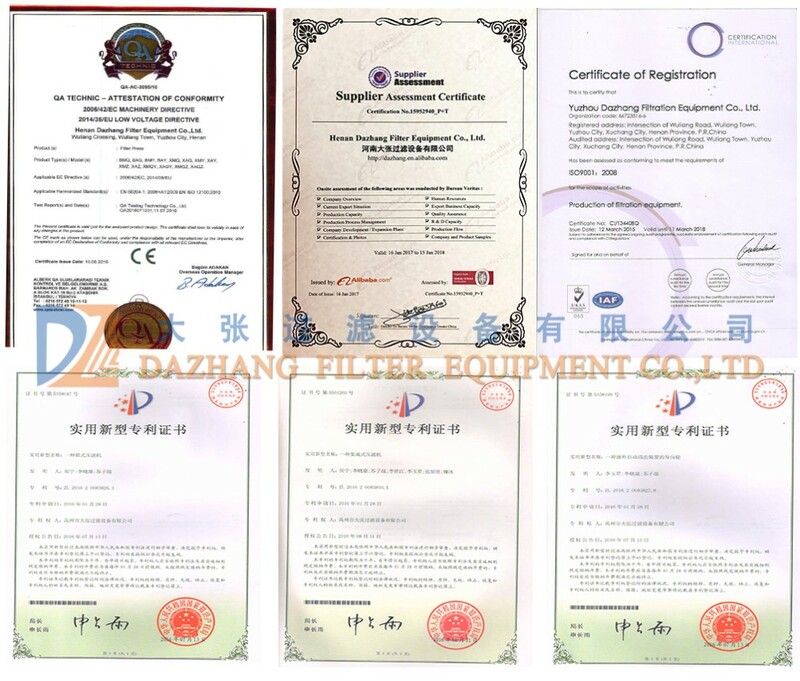 Henan Dazhang Filter Equipment Co., Ltd. is a professional filter press manufactures. It has three subsidiary corporations in Shanghai and Yuzhou. 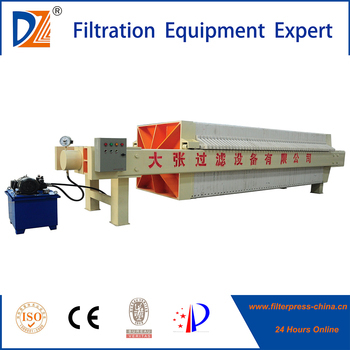 Now Henan Dazhang is the biggest filter press base in the center of China. We are specialized in designing, producing and selling filter presses and other related equipment. Our products mainly include more than 6series related hundreds of good sellers, such as Automatic Membrane Filter Presses, Automatic Chamber/Racessed Filter Presses, Hydraulic/Mechanical/Manual Filter Presses, Special Filter Presses, Filter Plates(including CGR Gasketed Filte Plates),Belt Filter Presses, Bag Filters ect. In order to meet different filtration needs of customers, we have been constantly developing and improving our prduct technology, quality, process automation and after-sales services. 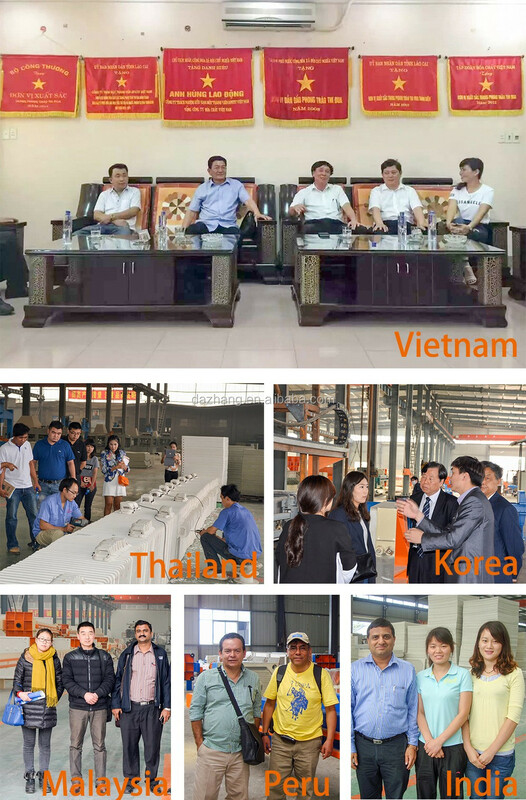 Our unremitting efforts for years have bought us great trust from customers and our products enjoy fast sales abroad. Our products find their extensive applications in the fields of petroleum, chemical, pharmacy, sugar refinery, food stuff, coal washing, oiling, printing and dyeing, ceramaic, mining and metallurgy, sewage disposal and so on. With good quality, our products are not only widely welcome in China, but also successfully exported to many countries,such as America, the EU, Russia, Australia etc. Many of our customers are lieted on Fortune Global 500 Companies. 1). Are you filter press manufuacturer? 2). Which country have your products been exported? Many country, such as Australia, EU, America and so on. And our company has agencies in Vietnam. 3). What industry application of this product? Many industries, such as chemical, food, medicine, sludge treatment and so on. 4). How many about your MOQ? 5). What is the voltage/phase for this machine ? 220V 50Hz 3Phs, 380V 50Hz 3Phs and 415V 50Hz 3Phs,also can made as the clients’ need. 6). What is the Mode of transportation ? 7). How long can we get the goods? 8). What about Payment term?